Family holidays are one of the most important events of the year. After all, how often do you get these precious moments to unwind together? That being said, the thought of taking little ones away can be a daunting one – you don't want to come home more stressed than when you went! That's why we've handpicked a whole host of holiday havens specifically with pre-schoolers in mind. Everything you need will be waiting for you upon arrival, so all you have to focus on is first steps and fun in the sun. Get ready for unforgettable family moments in one of our baby and toddler friendly villas. Time away with your little ones is always a treasured experience, so finding the perfect home from home is mission critical. 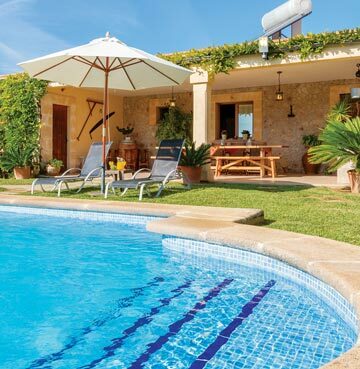 A villa holiday means oodles of quality time, flexibility and plenty of privacy to relax together. There's no rushing to get to the breakfast buffet before all the best bits go, or scrambling for sunloungers and pool space – it's all about you and yours. Our Baby and Toddler Villas have been handpicked to give your family a safe and relaxing time away together. From gated pools to enclosed grounds, there's lots of family focused features taken into consideration when selecting the perfect child-friendly villas. 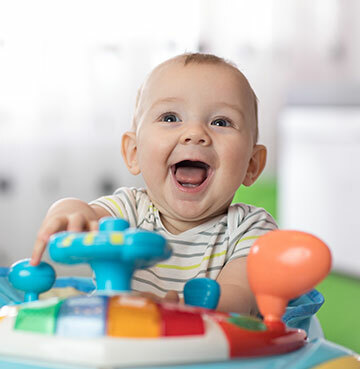 With all the safety essentials double-checked and ticked off, your little ones are free to explore their new surroundings, and you're free to start making new memories! When you're away from home, you want to know you're travelling somewhere that's made families the focus of their facilities. That can mean anything from making sure there's a microwave for heating milk to child friendly furniture and child-proofed interiors. Single storey villas and stairgates mean you won't need to worry about stair related stumbles and over-excited toddler tumbles. Keeping things on one level is a great way to eliminate any accident apprehension or chance of your child hurting themselves. Likewise, if your dream villa has stairs rest assured a stairgate will be placed around the property wherever necessary. Choosing a villa with a fenced or walled garden and enclosed grounds gives you added security, which is always nice. On top of that, it means adventurous little feet can't wander out of sight – so you'll know where they are at all times. Perfect if you're after a day of sun bathing and pool lounging. One thing no amount of planning can prepare you for with parenthood is the mass of gear you need on you at all times. Long gone are the days of travelling with hand luggage and minimal belongings, now it's all about spares and extras and 'better safe than sorry'. Not exactly the stress-free holiday mood you want to set, which is why we've put together a baby and toddler pack. All the important bits you can't do without will be ready and waiting for you at your home from home. So worrying about packing potties and high chairs won't be making an appearance on your holiday 'to do' list. All these items will be waiting for you upon arrival and are included with all Baby and Toddler Friendly Villas. Hooray to travelling lighter! One of the crowning glories of any getaway is the swimming pool. 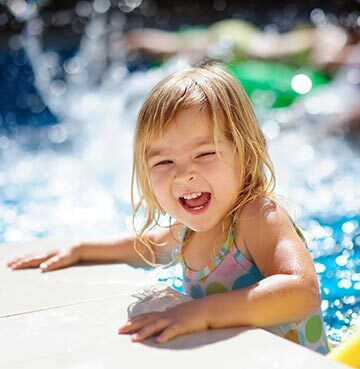 The best family holidays revolve around water-based fun times, splash happy shenanigans and paddling play times. That's why it's so important to find a pool that gives you the reassurance your kids are always safe. Villas with gated pools are always a great starting point. Curious little campers can't reach the pool without an adult, so you have peace of mind that they're safe and sound on dry land. When you're ready to make the most of your private pool, simply pop open the gate and play the day away. If you're headed out for a spot of winter sun (and making the most of off-peak travel before the little ones are at school) then a heated pool* can be pure heaven – especially for little hands and toes! Swim year-round safe in the knowledge that the water temperature is always welcoming, plus it's lovely and toasty for your youngsters. Shallow pools are ideal for tiny tots to make a splash. There's no danger of them being out of their depth, plus they'll feel like they've got their own little space to play. You'll find some of our villas offer separate shallow pools, a win for parents whose arms aren't quite up to the challenge of holding their water baby up all day! Pools with steps are a great alternative to ladders too. Parents can sit in the water while little ones paddle safely under their supervision. Pool panic is well and truly a thing of the past with all these possibilities! And who knows? 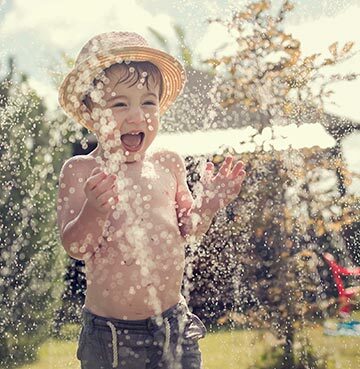 Perhaps these wonderful water moments might be some of your little ones first memories! *Please note that not all of our Baby and Toddler Villas have heated pools. Details can be found in villa descriptions. If you're not completely sure about a self-catering villa venture, then have a look at our Holiday Resorts. Ideal for families, you'll find you have the best of both worlds when you stay here. Enjoy the freedom and flexibility of a villa with all the first-class facilities you'd expect to find at a hotel. As well as your own private pool, communal pools are perfect for a splash of socialising. Children can play together and enjoy extra-special finishing touches like climbing frames and adventure playgrounds. If you've raised a social butterfly, don't forget about in-resort Kids' Clubs and crèches. 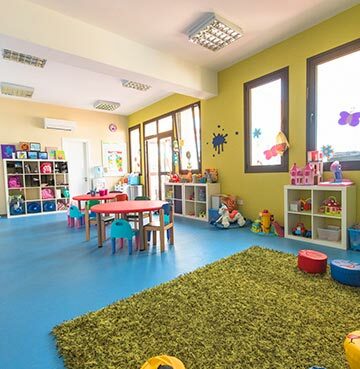 Your little ones will get to join in with fun-filled daily activities, while you get a few hours off to enjoy some quality 'adult' time.